And here we go with the first pretty much seasonal story. The one that really sets the mood. Now why I consider this very story quite a season-appropriate one is due to a maple leaf. The leaf itself and its colors, a combination of red, orange and yellow at the same time, to me do symbolize these real autumn vibes. Speaking of the maple leaf, it was presented to me by two old, yet highly sweet, Latvian ladies who'd been casually strolling through beautiful Ziemeļblāzma park. 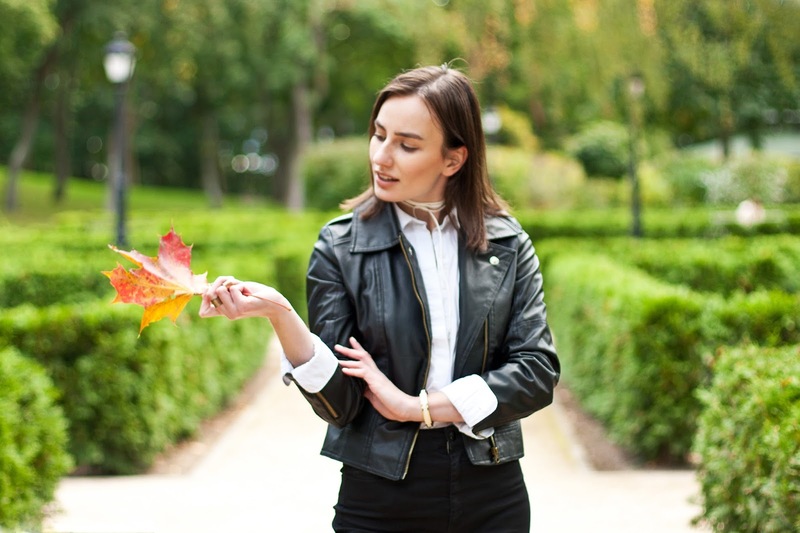 They though a leaf would perfectly complement my outfit and, well, they were so right. What about an act of two complete strangers who just decided to spread the love with a passer by? Simply a good guide on how to multiply positive vibes in this world . You know, it's actually funny how weather keeps changing here, in a little Eastern European city of Riga. 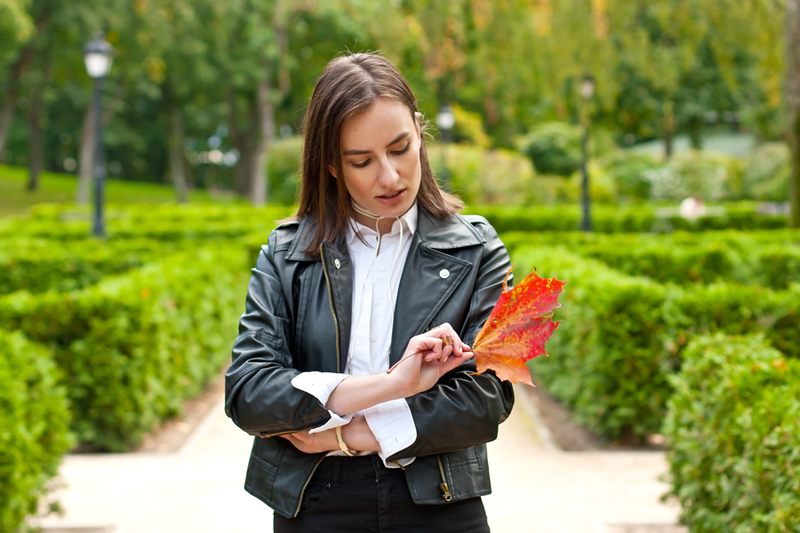 It was just mid-September and it felt pretty much like summer, then there were days when I had to bundle up in a trench coat and a jumper, then again it was warm enough for a leather jacket. One day it's all about raining, the next day sun shines as crazy. So, yes, we have finally entered the period when we have no entire idea whether you have to warm up already or a jacket will be just enough for today. But no regrets from my side. It's time for my endless outerwear range to shine. The first one step out in the limelight is the biker jacket, of course. So, since these cowboy boots are usually more involved in country-much kind of outfits I was thinking of pulling it within something more city-like, for a change. Something casual and dynamic at the same time, simply because boots are calling for such vibes. What can be better than a classy combination in black and white? Yes, this outfit is all about autumn's basics that can be used again and again throughout the season, and further on. Another important element here is a long choker that works hand in hand with quite an unbuttoned shirt, and adds a seductive note. Oh, and a maple leaf. Never underestimate the power of a maple leaf. Amazing look - really great!